The overgrown orchard stands behind an unoccupied home on a discontinued gravel road. In this season the apples, in shades of red and gold, bend the tree branches low. Wolf Rivers, Cortlands, Yellow Transparent, Northern Spy. Some of the apple varieties date back centuries and taste finer than any modern variety, especially when picked and eaten while hunting . Under the trees are signs of feeding deer, the grass trampled, apples half eaten, and there are beaten down trails connecting tree to tree. Thickets of red-twig dogwoods and nannyberry surround many of the old trees. Off to the left is a patch of raspberries and sumac. Just beyond them stands a mix of maples, aspen, oak, spruce, hemlock, and balsam fir. An old skidder trail, now grassed in, runs through there. It skirts a cedar, winding between gigantic, white pines and young hemlock - eventually dying out on a ridge of almost pure oak and beech. 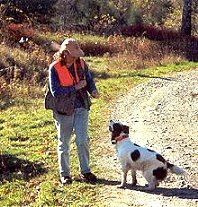 As I shuffle into my game vest and load my shotgun, my white and black Springer sits patiently at my feet, looking up in anticipation of being cast off. He's a young dog, given to running a little big sometimes but this morning, on the frosty ground, he hunts close. The orchard slopes upward, to the east. As we walk the edge, Finn working the growth of pole thick aspen and maple, the sun rises higher. It starts to burn off the frost causing a mist to swirl across the sweet-smelling meadow grass. Tail waving enthusiastically, Finn flushes a woodcock, and then another. But the season is not open yet, so I tell him "no bird" when he looks back to me for an explanation of why there were no gunshots. A few more steps and three grouse flush out of an apple tree, hell-bent for the cover of the softwoods. Again, the questioning look, but the birds surprised me as they volunteered. The morning is young and we still have many covers to check. Right now the chill of the air and the overwhelming scent of apples combined with the almost absolute quiet of early morning is enough pleasure. In the far distance I can barely hear the buzz of chainsaws. I know as the day warms up there will also be the buzz of yellowjackets feeding on the half rotten windfall apples. "...the perfect place to hunt with a close working, hard driving spaniel." We cut across the top of the orchard, wading through a sea of ground hugging juniper, cross a tumbled down stone wall, and turn onto the discontinued road. It is now shown on the topo maps as merely a dotted line connected to other dotted lines. The woods on either side of the road are quite mature and seldom hold a grouse until later in the season so we continue past. We are soon walking in a golden haze as sunlight glows through the yellow leaves of the huge sugar maples that mark the boundaries of what were once hayfields and homesteads.